BRUSSELS (Sputnik) - Western countries, looking back at how the situation in Libya was handled, have come to understand that the only option for solving the Syrian crisis would be to achieve a political settlement, Belgian Foreign Minister Didier Reynders said Thursday. "The only way out of the Syrian situation is a political solution. Firstly, we are drawing conclusions from what happened in Libya… It was a military attack, maybe successful, but without restoring the country and political settlement. We want to avoid that in Syria," Reynders told the RTBF broadcaster. The foreign minister expressed regret over the fact that Syrian authorities had not yet provided experts from the Organisation for the Prohibition of Chemical Weapons (OPCW) with access to the site of the alleged chemical attack from earlier this month over security concerns. The OPCW seeks to investigate the site of the alleged chemical attack in Damascus suburb of Douma. On Tuesday, the United States and its allies said that Russia and Syria continue to deny the OPCW access to the site, an accusation which the Russian Foreign Ministry called unscrupulous. On Wednesday, OPCW said that it did not know when its Fact-Finding Mission (FFM) could be deployed to Douma to investigate the alleged chemical attack after the UN reconnaissance team escorting the FFM got under fire. 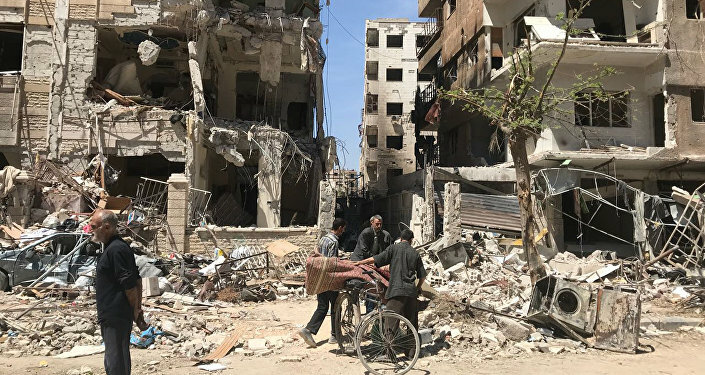 The news follows the US, UK and French missile strikes that were carried out on a number of targets in Syria on Saturday in response to the alleged chemical attack in Douma on April 7. The attack was launched just ahead of the OPCW's inspection of the site. Western states have blamed the Syrian government forces for the purported incident, but Damascus has denied using chemical weapons.